Great Ocean and Mountain Views in Ali'i Kai II. 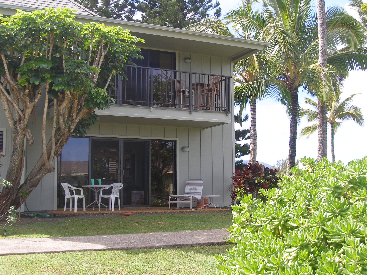 This two bedroom/two bathroom offers ocean and mountain views from kitchen/living/dining rooms. The master bedroom has mountain and waterfall views and the second bedroom has ocean views. Each bedroom has its own separate bathroom. This is a ground floor end unit with no stairs to climb. Possible Seller Financing. AOAO (Association of Apartment Owner) Fees are $706 per month. Current Real Property Taxes are $611 per year. County Assessed Value is $311,100.